WCC press meet: Here's what members of Women in Cinema Collective (WCC) are saying at a press conference in Kochi. WCC is a group comprising of female members of Mollywood. 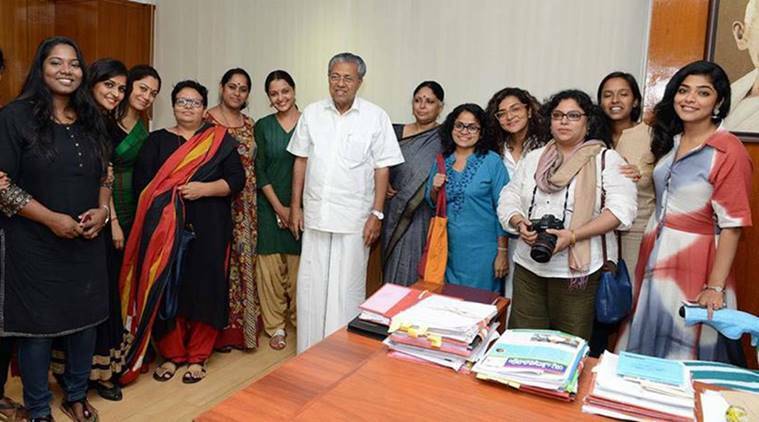 Women in Cinema Collective (WCC) on Saturday held a press conference at Ernakulam press club in Kochi, Kerala. WCC is a group comprising of female members of the Malayalam film industry. The goal of WCC is to create a positive atmosphere for the women members of the film fraternity and address gender-related issues. Read all the updates from Women in Cinema Collective (WCC) press conference. Read updates in Malayalam. In a week or two we will take the next steps, says Women in Cinema Collective. WCC’s social media manager gets emotional recalling the amount of abuses the members face on Facebook. 'I feel verbally raped 100 times every day, " she says. A small-time actor and a member of the WCC says she filed a complaint with Film Employees Federation of Kerala about an uncomfortable experience she faced when working in Mammootty starrer Pullikkaran Staraa. The accused was a production controller, but no action was taken against him. While I am still struggling to find jobs, he is thriving, says the woman. In Bollywood, Aamir Khan drops out of a film because the director was accused of sexual harassment. Akshay Kumar did the same with Houseful 4. MAMI cancelled screening of movies of the accused. But only in Malayalam, the filmmakers announce movies with the accused, says Rima Kallingal. Since its inception, the WCC is being seen as a threat by other film bodies in the industry. We wrote to all organisations for the cooperation to address all issues of women and make it a better work space but none of them responded to us, says Bina Paul. Padmapriya says the EC flouted all the rules of the AMMA to accommodate Dileep. We lost the faith in the leadership of AMMA. But we still have faith in AMMA as an organisation, says Parvathy. We want to expose that the industry is not a big happy family that you are led to believe, says Parvathy. We are not resigning, and we are not doing MeToo just now. This press meet is just the beginning, says Bina Paul. We are not here to shame the industry. Yes, we are aware of many stories which will come out soon. It's not a threat. But we are here to stand by the survivor, who has lost her livelihood, says Bina Paul. We are here to fight. And it's just a beginning, says Remya Nambeesan, explaining why she quit AMMA. What are we giving the survivor in return, asks Revathy. The survivor showed courage. And what are we giving her in return, says Revathy. It's about time we bring about a change. I have a daughter. She may also join the industry. I have children of my friends working here already. I want to make the industry a safe place for everyone, says Revathy. In the recent letter, we were told if the survivor and three other women actors want to rejoin the AMMA, they should send in an application and the EC will send it to the general body for consideration, recalls Revathy. At emergency meeting, we were made to feel that an historic result will be made today. We even took suggestion from Vrinda Grover. But they kept procrastinating. We trusted them. I think it was just a cover up to stop us from talking to public or media, says Parvathy. We feel disrespected, insulted and angry, says Parvathy. This is a joke. There is deep misogyny. Who are they trying to fool?, says Padmapriya. The accused is not suspended or has not resigned. The survivor has resigned but the AMMA invokes bylaws when asked if they will reinstate her, says Padmapriya. AMMA hiding behind the bylaws. They are trying to protect the accused, says Padmapriya. When we were called on August 7 for an emergency meeting, we hoped for a solution. But we only faced accusations. We kept requesting them to listen to us for 40 minutes but they didn't, says Parvathy. AMMA office bearers have denied justice. It's not personal, says Revathy. Gist of letter: The accused actor has been taken back into AMMA. He has constantly caused me trouble by stalling my opportunities in films. Now I have no reason to believe the association will help me. Parvathy reads survivor’s resignation letter sent to AMMA. AMMA president did not even mention us by name. We have all worked in the industry for many years now. I joined AMMA in 1994 when it was founded. That's why we felt the need to introduce ourselves, says Revathy. We need support, says Anjali Menon. The whole country is now listening as women speak up but it's not happening in Kerala. We need support not just in words but also in action, adds Anjali Menon. Women in Cinema Collective (WCC) press conference is all set to begin. The WCC resistance led by Revthay, Parvathy and Padmapriya had sent two letters to the AMMA demanding them to take back their decision to reinstate Dileep. But AMMA executive committee has declined to do so by passing the buck to the General body committee. Female actors to resign from AMMA? AMMA General Secretary Edavela Babu had on October 11 made it clear that AMMA Executive Committee will not take a decision about the suspension of Dileep and have instead delegated this duty to the General Body. The buzz is that many more woman actors are expected to resign from AMMA membership in protest. Women in Cinema Collective (WCC) posted on Facebook, "WCC will be holding a press conference this evening 4pm at Ernakulam press club. We cordially invite all our media fraternity to be a part of this event. The event will be live streamed on Facebook. Thank you! Disclaimer: Press conference restricted for members of media!"